This week we have a ‘Wee Play’ quilt top in the works and a Penelope Waits’ cross stitch. I started the Wee Play quilt back in 2010 but put it aside after deciding it really was going to look like a children’s quilt, but I had no children! Fast forward to now and I’m enjoying making it for Elijah! 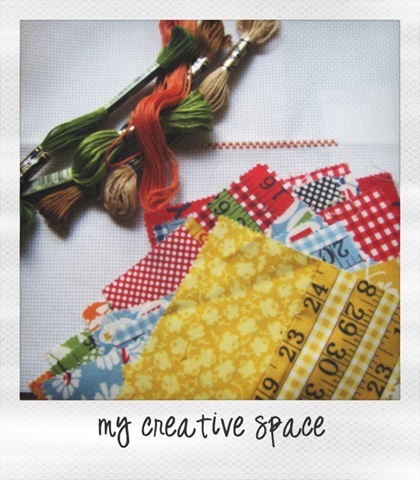 I’m participating in Our Creative Spaces. Love that measurement tape fabric! :) I look forward to seeing how your quilt turns out. Happy stitching (on both). Looks like it is an exciting time in your creative space. I have been wanting to try cross stitch for a while. I even bought materials to try a project, but am yet to actually start it. Can’t wait to see more of you quilt. Wonderful that you are able to rekindle an old project, your creative space looks so interesting! Hello, Thank you so much for joining me on my PCH journey! I’ve added your link to my sidebar and I’m here to wish you luck and have a little lookie around. I think I’m going to enjoy it too, because I like what I see already! So, good luck, can’t wait to see what you get up to! Isn’t it great when you rediscover an old project and give it a new purpose! Love the bright colourful fabrics that you are using.